Tomorrow is the first ever College Football Playoff Championship. Are we excited or are WE EXCITED?! So what does this game have in store? In the right corner, we have Urban Meyer and his Ohio State Buckeyes. You have to admit, the Buckeyes 42-35 win over Alabama had us all in shock. 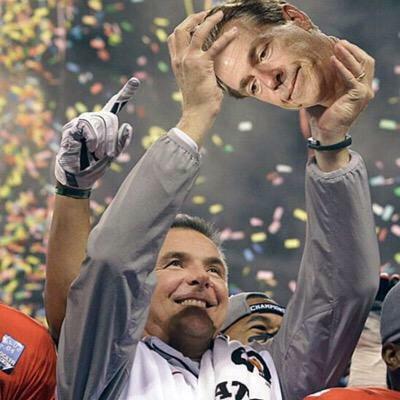 I think it is safe to say that Urban Meyer now has Nick Saban by the cojones. 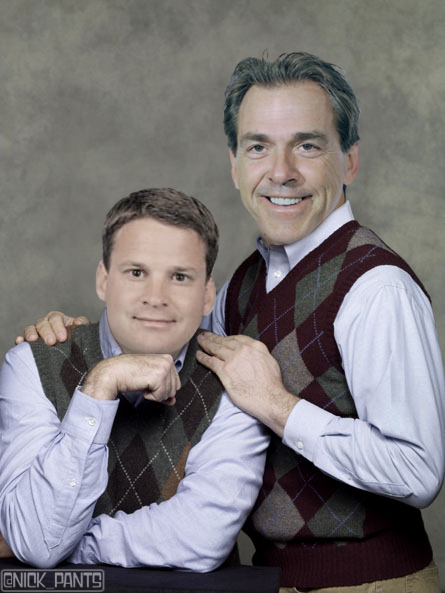 Sorry Saban, maybe you need to get rid of your Offensive Coordinator. 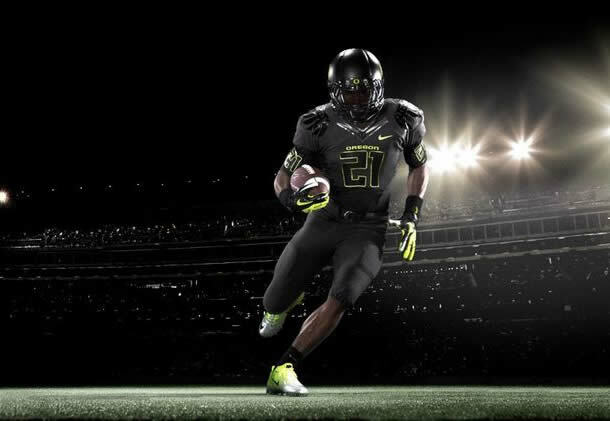 And to the left, we have the Nike-owned Oregon Ducks. Those gosh darn kids have so many different football uniforms, they could clothe an entire Mexican village. Heisman winner Marcus Mariotta has had a stellar season, completing nearly 70 percent of his passes, 4,121 passing yards, 731 rushing yards, 55 total touchdowns and three interceptions. Dayum. Who is the better team? I honestly have no idea. As a fan of neither team, you always need to root for your team’s conference to win. So in this instance, go Pac-12. Bias aside, I think it will definitely be an interesting nail-biter . Hell, the Buckeyes beat Alabama, Urban Meyer defeated The Lord of the Rings, Gollumm defeated Sauron. That is crazy talk. Well I’m sure Tim Tebow is one happy camper. Aside from winners and losers, this isn’t just any championship football game, this is about making college football history. Granted the trophy is nothing to be proud of nor the location of the game, Dallas, this game is a kick-off of what we hope will be a long Playoff tenure for College Football. I wish upon a star….. Although the Playoff Committee did receive some flack regarding their snub of TCU (sorry horned frogs, we gotta give other Christians a chance), you can’t help but assume that the Committee was going to experience some grief their first time around. No system is perfect…..::cough BCS cough::. All we can hope is for the Playoffs to NOT be dominated by the SEC team. Even though Ohio State is in not in the SEC, who the hell wants to see Urban Meyer get up there and raise that sad excuse for a trophy? The guy is a flat-out liar who hates his family. He blatantly choose his football coaching career ($$ cha-ching $$) over focusing on his family as well as improving his “ailing” health condition. Some health condition, a condition that took him all the way to the championship game. Yea, well….we will see how that will work out. You gotta be rooting for Oregon. They have yet to win a National Championship, have a Heisman Trophy winner playing as Quarterback and just look so damn cool on the field. 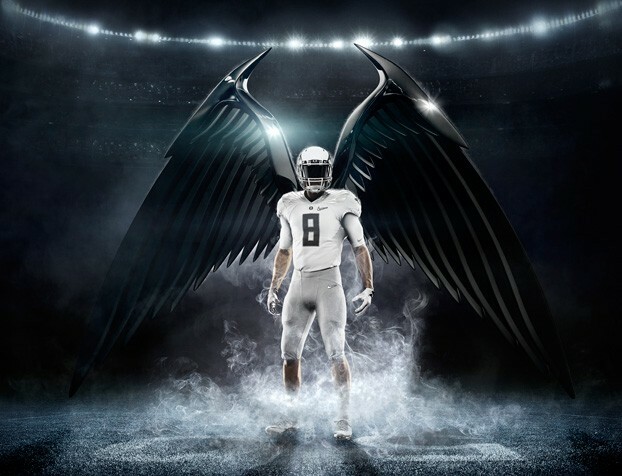 In every notable game they have ever played, the Oregon Ducks have always worn a different uniform. Thank you Nike. Intimidating? Not so sure you can be badass in white. Although they did look pretty sweet when they looked like Ninjas. So let us watch the game tomorrow night in high spirits, not only for the Oregon Ducks but for the College Football Playoffs. I would like to think that the outcome of this game doesn’t necessarily matter, but it does. The viewership of this championship game is what is what matters. The number of those viewers who positively promote the Playoffs is what matters. If nobody watches, it is just a matter of time until the NCAA decides to revert back to the good ol’ BCS. I give it five years.